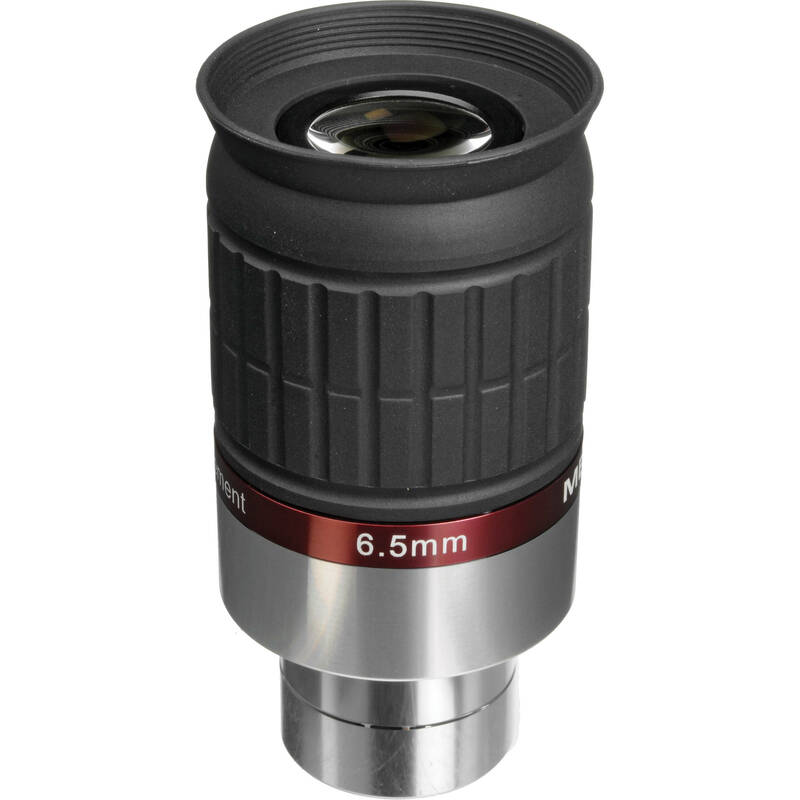 The Meade Instruments Series 5000 HD-60 6.5mm Eyepiece has a wide 60° field of view and a generous 17mm eye relief to present users with a high power, with a comfortable and immersive observational experience. Its lens is made in a 6-element configuration with fully multi-coated optics, blackened lens edges and internal surfaces to improve color rendition and contrast and light transmission, while limiting its loss. The long eye relief gives users room to back off from the eyecup for a more comfortable viewing experience with a reduced risk of accidental contact with the eyepiece. This can cause vibrations and interfere with views. The eyepiece features a standard 1.25" barrel to be compatible with the most popular size of focuser and accessories. A rubberized textured collar ensures a secure grip when handling it, and its twist-up rubber eyecup enables easy viewing with or without eyeglasses. Box Dimensions (LxWxH) 5.6 x 3.6 x 3.4"
Series 5000 HD-60 6.5mm Eyepiece (1.25") is rated 3.7 out of 5 by 3. Rated 4 out of 5 by TDK from Good value, good quality This seems like a solid eyepiece, and it feels impressive. I've only used it briefly, but the view seems nice, if not as luxurious as the 82 degree eyepieces. My copy, while perfectly functional, had a slight cosmetic blemish on the barrel out of the box, and there seemed an inordinate amount of dust on the inside of the box (though the optics appear to be clean). Rated 5 out of 5 by Thierry from Very good high magnification eyepiece. Very good eyepiece with great eye relief, sharp image and decent field of view. Much better than the Meade Series 4000 6.4mm. Excellent on planets, the moon and double stars. I bought mine for the Mars opposition and the eye relief helped a lot. Rated 2 out of 5 by yitzi the aspiring astronomer from Too much of a good thing I thought that this product will help magnify, the planet Jupiter in my telescope. It was a big flop and an expensive one at the same time.